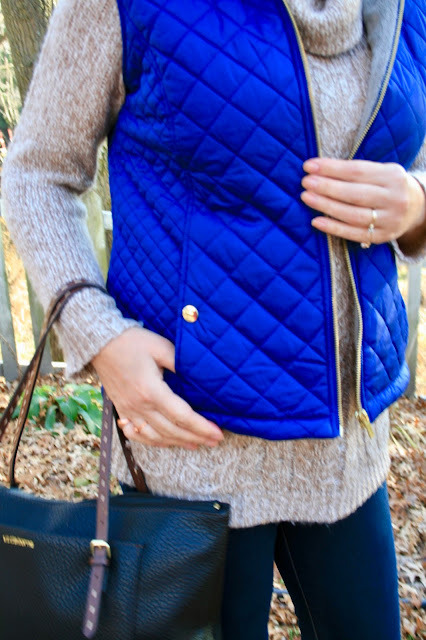 I am such a sucker for quilted or puffer vests. I had to stop at the mall to pick up some contacts that I ordered and I parked by Sears since the optometrist was located close to that anchor store. 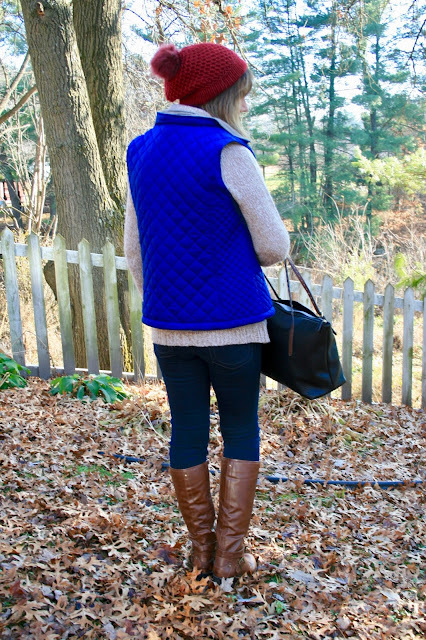 Well that was a mistake because as I was walking through the store I spotted this cute blue quilted vest and it ended up coming home with me! I love quilted vests for my frigid Wisconsin climate. They keep my core warm without the bulk on my arms. I now own five vests in various styles, thicknesses, and colors. The vest is not quite this vivid blue in real life. It is a bright, medium blue. 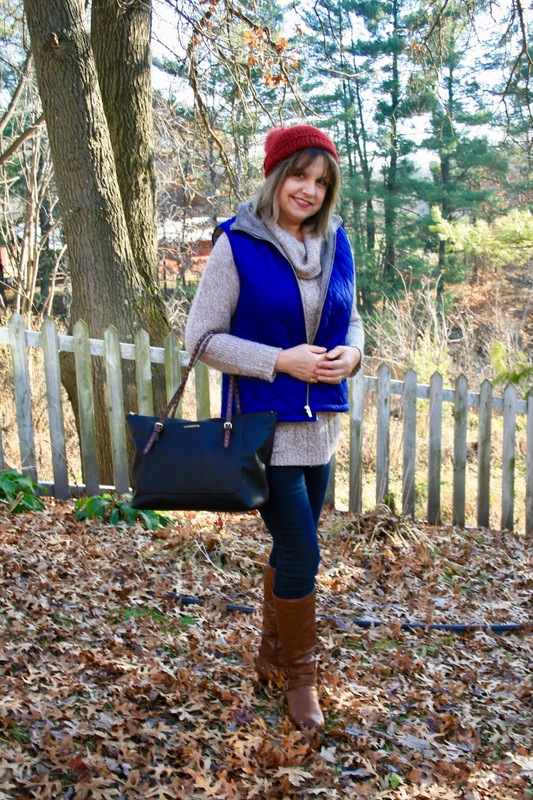 I paired my vest with dark blue denim, a beige cowl neck sweater, a burgundy pom pom beanie, and tall cognac boots. I wore this outfit shopping. What attracted me to this particular vest was the grey fur lining, the gold accents, and the quilted design. It is a thinner vest, so it's not as reliable for colder temperatures for outdoor activities as my burgundy puffer vest is; but that's OK, because then I can wear it more comfortably indoors or on warmer days. 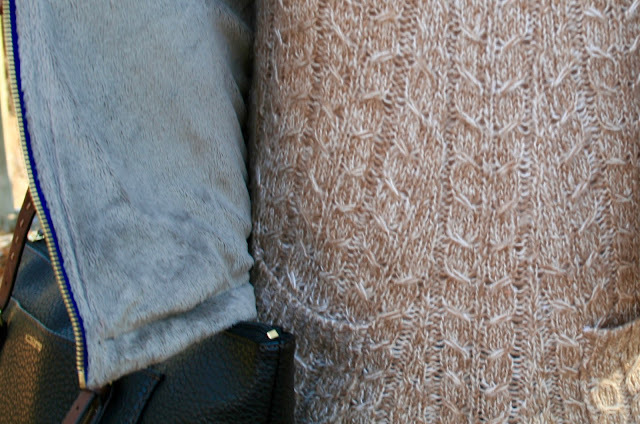 As I stated earlier, the quilted detailing and the gold buttons and zipper are very attractive. My tall cognac boots are old. I love the flat style to wear for shopping. The Elizabeth Tote is by Liz Claiborne and sold at JCPenney. It's hard to see in the picture, but the beanie has gold thread weaved throughout. 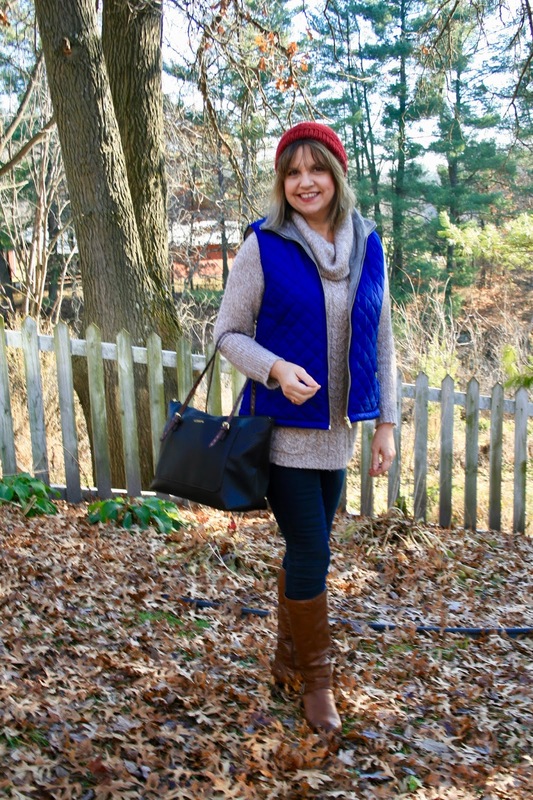 As I write this post, this vest is still available at Sears and is cheaper than when I bought it! It's on sale for $16.00 and comes in several different colors! Thank you! Yes, I'm looking forward to celebrating my first Christmas with a granddaughter! Love the vest! Such a good color of blue. 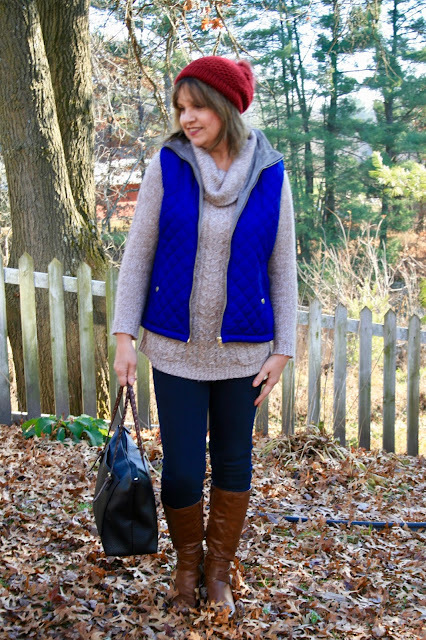 This vest has such a pretty blue color and it looks great with the red beanie. I also like that you went with a tan colored sweater instead of white. I need to look and see how many vests I have, but I bet I have about 5 or so, too. Thanks Carrie! I actually got the idea to pair the tan with the navy from Pinterest! And it's good to know that I'm not alone with the Vest collection! haha! What a pretty blue. I have several vests and forget to wear them. But actually for our winters, a vest paired with a sweater or long-sleeved shirt is about all we need to run in and out of stores and home. Thanks Leslie! I so agree, that is vest is usually all you need for errand running. That blue vest is beautiful! What a gorgeous bright blue! I love the quilted pattern! Oh that is my favourite shade of blue, Amy and those boots look so stylish. Thanks for sharing this 'look' with us at #overthemoon. Beautiful look Amy, your vest is gorgeous! Hello Amy! I feel like it's been far too long since my last visit here. Oh to have more hours in the day to visit all the wonderful bloggers. On my last visit you were enjoying your new grand baby! Anyway, I love how you styled this outfit. The vest is such a pretty blue and the beret is adorable on you! Thank you for sharing with the Thursday Moda! Thanks Chrissy! I know the feeling, that's why I prefer Instagram and also why I think a lot of bloggers are closing down their blogs and just doing Instagram because it's less time consuming.